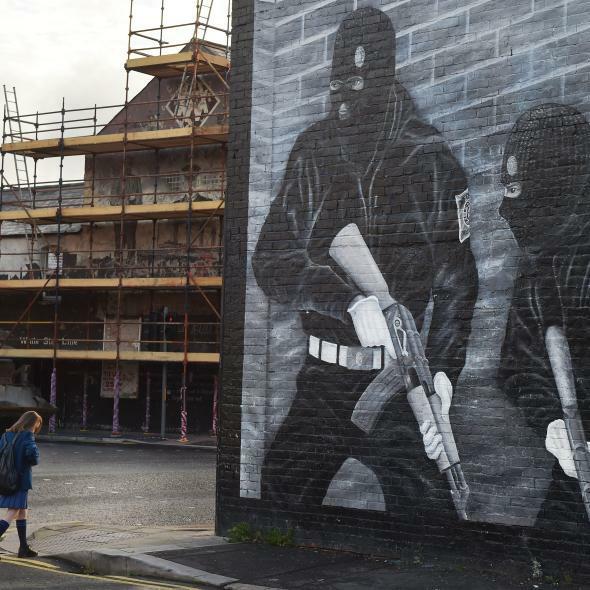 A schoolgirl walks past a loyalist paramilitary mural on Sept. 21, 2015, in Belfast, Northern Ireland. Prominent Northern Irish political leader Gerry Adams will not be prosecuted for his involvement in the 1972 murder of Jean McConville by members of the Irish Republican Army, a case that has haunted Northern Ireland and its leaders for decades. The news comes at a time when Northern Ireland is the midst of a full-blown political crisis and the backlash to a more recent murder is threatening to derail the fragile peace process in place since the 1990s. Adams, whose Sinn Fein party was once known as the political wing of the IRA, was arrested last year in connection with the murder of McConville, a mother of 10, who was allegedly among those “disappeared” by the IRA after being accused of informing to British security forces at the height of the Troubles. Adams has denied even being in the IRA, but was accused of giving the order for McConville’s killing based on interviews with former members of the militant group by Boston College researchers for an oral history project. The case was described in great detail in an excellent article by the New Yorker’s Patrick Radden Keefe in March. But on Tuesday, Northern Ireland’s Public Prosecution Service announced that there was insufficient evidence to pursue a case against Adams and six other people accused of involvement in the case. One of those other individuals is Bobby Storey, a senior member of Sinn Fein and aide to Adams who is also accused of involvement in two more recent murders at the center of Northern Ireland’s current political crisis. Jock Davison, a former IRA commander was gunned down in May on the street in Belfast. In August, the main suspect in his death, a former IRA hitman named Kevin McGuigan, was himself murdered. Police believe McGuigan was killed by members of the IRA in retaliation for Davison’s death. Storey was among those detained in the wake of McGuigan’s murder, though he has not yet been charged. The police have made clear that they do not believe the IRA’s high command ordered the hit on McGuigan. The case led to the resignation of Northern Ireland’s First Minister Peter Robinson, as well as most of the members of his Democratic Unionist Party (DUP), leaving the power-sharing government in “zombie form”—just barely maintaining public services. It’s not that Northern Ireland’s pro-British protestant parties are really that worked up about aging IRA militants shooting each other, it’s that officially the IRA isn’t supposed to even exist anymore. Sinn Fein and the pro-British unionists share power under a 1998 peace deal that required the armed group to disband. The DUP says it won’t share power with Sinn Fein if the IRA is still active. Sinn Fein, meanwhile, accuses the unionists of using the incident for electoral gain. The two sides were already at loggerheads over how to implement budget cuts mandated by London. If the crisis isn’t resolved, British Prime Minister David Cameron could reimpose direct rule over Northern Ireland. There are also fears that extremists on both sides could exploit the crisis as a pretext to resume violence. The Northern Ireland peace process, a genuinely incredible feat of diplomacy that mostly brought an end to one of the longest and most intractable conflicts of the last century, always depended on a certain amount of willful ignorance. As Radden Keefe discussed in his piece on the McConville case, Adams had the credibility to negotiate a deal on behalf of the IRA because it is widely known that he was once a member. But he always denied it, and the British government had to pretend to believe him, because they could not own up to negotiating with a known terrorist. Similarly, it seems as if it’s not really news to anyone that the IRA still exists in some form, as do violent protestant paramilitary groups. As long as the violence was minimal, everyone could simply choose to ignore it. But the recent murders, the revelations in the Boston College tapes, and the political maneuvering by unionist politicians looking to seize advantage, have made the polite and necessary fictions that underlie Northern Irish politics harder to maintain. There’s unlikely to be a return to the level of violence that killed 3,600 in the three decades before 1998, but the way of doing business that has kept the peace since then no longer seems to be working, and the situation is looking very fragile.